You don't have to be a craft goddess to make your own cat toys. In fact, it's easy and inexpensive to go the DIY route, and your fuzzy feline will love them just as much as store-bought toys - maybe even better! Before we talk about how to make your own cat toys, it's important to understand just what attracts a cat to a particular item. Although we owners might tend to choose a brightly colored toy that catches our attention, our cats couldn't care less whether a toy is fuschia or neon green. Cats don't perceive colors the same way we do, and they also don't care much about shapes either. The first thing that truly catches a cat's eye is movement, so toys that can be rolled, dragged or twitched are bound to capture your cat's attention. The second most attention grabbing feature of any cat toy is sound. Cat's love things that crinkle and crackle, and luckily these items are some of the easiest and least expensive toys you can make yourself. Keeping the concepts of sound and movement in mind, let's look at some ideas you can use to make your own cat toys. Have any old fishing poles lying around unused? Try converting them into fishing toys for your cat. Select one of your used poles and remove any remaining hooks. Tie a stuffed mouse or plastic fish to the end of the line. You can hold the pole over Kitty's head and coax her to bat at the goodie, or try dragging it across the floor for her to chase. Just be sure not to pay out too much line, or she might become tangled. Cats love to bat at toys and wands are a sure way to drive them crazy. Take a piece of aquarium tubing approximately two feet long and tightly tie some large feathers to the end. Lightly rub the feathers with some catnip and then dangle in front of Kitty. Your pet's sure to become engrossed with capturing his quarry and you'll get a kick out of his antics. Cat scratching posts come in all sizes and price ranges, but you can make your own for less. Wrap sisal cord around a one by six-inch board, any length you choose. Secure the cord with non-toxic glue as you go. Simply lay the board on the floor or secure it to the wall with screws. Rub a little catnip on it, introduce your cat to it, and let nature handle the rest. Your cat should be irresistibly drawn to her new scratching toy. Sometimes the container is more fun than the toy that came in it. Cats are secretive by nature and love nice dark caverns to hide in. Offer your cat a large paper shopping bag or cardboard box. Entice him to go inside by adding one of his favorite treats. Once inside, he'll love the rustling and scritch-scratching sound his claws make. He may not come out for hours. When all else fails, a ball of yarn makes a wonderful, if sometimes messy, cat toy. Let your cat roll it around the floor and pry the threads loose with her paws. This satisfies both her predatory instincts and the need to work her claws. When the ball is a complete wreck, throw it away and replace it. Here are a few tips to follow when you make your own cat toys. Make sure your toys don't have any sharp edges that might injure your cat. Avoid using very small items that could be swallowed and cause a choking hazard. 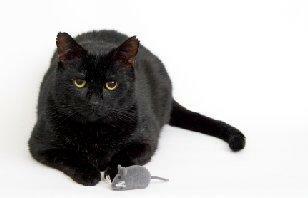 Be aware that string toys can become wrapped around your cat's neck, causing strangulation. Always supervise your cat's play with any toys. Hopefully we've given you enough ideas to help you get started making your own cat toys. Yes, you could just buy them from a store, but wouldn't it be more fun to give your feline friend something that you made especially for him or her?